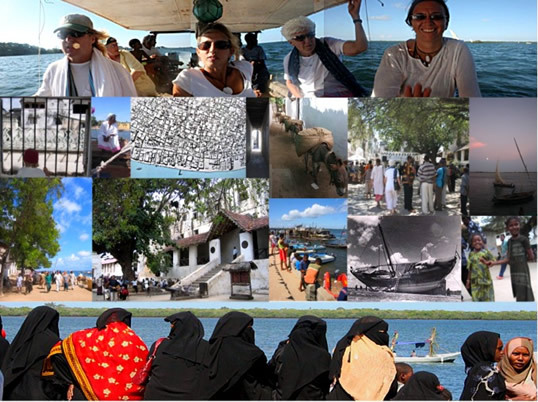 People have been visiting Lamu and Pate Islands on the East African coast for 1000 years or more. Though the islands have had settlement of one sort or another since the 9th Century, some visitors have been made more welcome than others over the last millenium. The way of life here is a fusion of many cultures as varied as the Chinese, Portuguese and British; though it is the Arabic influence that has given Lamu its distinctive personality. Softened by the sea and the gentleness of the Kenyan coast, the Swahili people are charming hosts. A Layman's Lamu History Lesson! For thousands of years, merchants from India, the Eastern Mediterranean, Arabia and the Persian Gulf set up trading posts along the East African Coast, shipping gold, animal skins, elephant tusks, rhino horn, ambergris, fruits, salt and human cargoes of slaves and concubines. Payment was usually made in the form of bartering cotton cloth, silks, axes, knives, wheat, rice, and glass. Fine porcelain from China was also exchanged. The oldest known settlement on the Kenyan coast is at Shanga on Pate Island dates back to the 9th Century. By the 13th Century the Nabhani, a dispossessed group of Omani rulers had laid claim to Pate and were trading with Persia and visitors from even further afield. The presence of Chinese artifacts from wrecked exploration vessels and the occurrence of such oddities as noodle making presses in the Swahili culture puts the Chinese in the archipelago as early as the mid 1400's. In 1505 the King of Lamu agreed to pay the Portuguese for protection from the Nabhani and for the next 180 years the island was under Portuguese control until they were themselves driven out by the Omanis. Lamu then became a republic ruled over by an installed 'yumbe' council of elders. For the next 150 years, the island prospered in all respects, creating its own architectural style. The town is famous for its amazing architecture and stone houses with exquisite carved lintels and doors that still stand to this day, keeping the original town plan intact. Lamu became the leading centre for trade on the East African Coast, with a busy port, exporting ivory, tortoise, shell timber, mangrove logs and thousands of slaves, who were transported to the Persian Gulf and Arabia, as well as to countries in Europe and India. Lamu Fort was built for the Omanis in about 1812 but not completed until 1821. From 1910 until 1984, it was used as a prison. Such was the success of the rulers that they even defeated the ruler of the neighbouring island of Pate at the Battle of Shela in 1812, when he tried to take Lamu Island with help from the Mazrui family in Mombasa. The victory was short lived because the yumbe panicked and requested help from Seyyid Said, the Sultan of Oman who happily sent a garrison to occupy Lamu, then go on to defeat the Mazrui clan in Mombasa and take control of the East African Coast, moving his headquarters from Oman to Zanzibar. In 1873, the British forced Sultan Barghash of Zanzibar to close down all the slave markets and with the abolition of slavery, Lamu's economy went into decline. It only began to recover in the early 1960's when the gentler invasion of tourism first came to the island. Every year in November, to mark the birth of Muhammad, Lamu celebrates with a week long Festival that draws in pilgrims from all over East Africa and the Indian Ocean and where the entire town is involved in processions and dances. From a tourist perspective, a walk around Lamu Town is a truly memorable experience. There are so many traditional Swahili homes to be seen and over recent years there has been a massive revival in Lamu woodcarving. The town has a couple of the most interesting small museums in Kenya with a well documented nautical section. Lamu is also famous for its citrus and tropical fruit farms that produce the sweet juicy grapefruit and the giant aromatic mango. A rebuilt produce market in front of the fort has a huge array of fresh fruit, fish and shellfish. There is also a crab and lobster market close by. Lamu Town was designated a World Heritage Site in 2001 by UNESCO based on several criteria including architecture and multicultural Swahili pedigree of Indian, Arab, Chinese and European influences. Lamu Old Town is the oldest surviving Swahili settlement in East Africa.